TeamViewer 10 Download Free For Windows, Download TeamViewer 10 Beta for Windows 7, Windows 8, and Windows 10 !! Everyone is well-familiar with TeamViewer and its usefulness, and hope you are too. But if you are still not familiar with it then i would like to explain you in short – TeamViewer is a computer software application that offers the remote control, desktop sharing, online meetings, web conferencing and file transfer facility between computers. Most interesting part of TeamViewer is, it’s fairly compatible with all operating systems such as Microsoft Windows (Windows 7, Windows 8, and Windows 10), OS X, Linux, iOS, Android, Windows RT and Windows Phone. The developers team of TeamViewer always want to provide maximum helpful and convenient features to its users and that’s why they release a new version of TeamViewer software every year. They continued their experiment or improvement and this year again they released a new version of TeamViewer software called “TeamViewer 10”. TeamViewer 10 is the latest and exclusive version of TeamViewer which came up with various improvements and new features. Currently, TeamViewer 10 is in Beta version and the TeamViewer’s developer team are experimenting on it to make perfect. 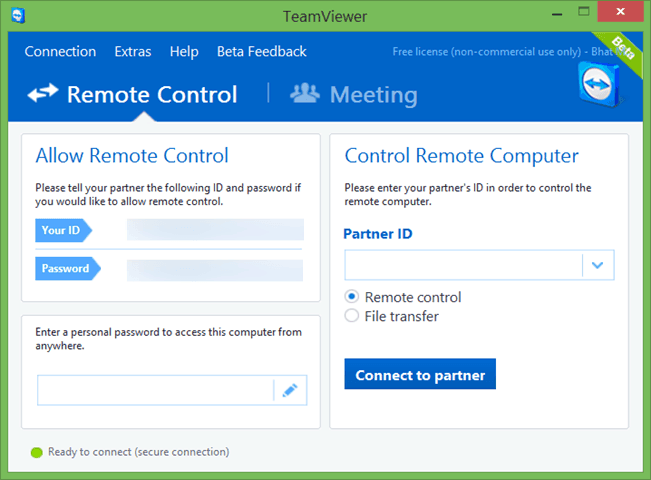 According to the sources, TeamViewer 10 users can freely establish remote control connections to TeamViewer version 3 or higher. But due to technical and licensing reasons, users can’t remotely connect from TeamViewer 8 or 9 to TeamViewer 10. Similar to its older versions, TeamViewer 10 is free for personal use and non-commercial use. If you want to grab this extraordinary and the latest version of TeamViewer 10 then visit its download page through below given link and download TeamViewer 10 Beta as soon as possible.